"HP 1 is one of the surviving members of the fundamental building blocks that assembled our Galaxy's inner bulge," said Kerber. Until a few years ago, astronomers believed that the oldest globular star clusters—spherical swarms of up to a million stars—were only located in the outer parts of the Milky Way, while the younger ones resided in the innermost Galactic regions. However, Kerber's study, as well as other recent work based on data from the Gemini Observatory and the Hubble Space Telescope (HST), have revealed that ancient star clusters are also found within the Galactic bulge and relatively close to the Galactic center. Globular clusters tell us much about the formation and evolution of the Milky Way. Most of these ancient and massive stellar systems are thought to have coalesced out of the primordial gas cloud that later collapsed to form the spiral disk of our Galaxy, while others appear to be the cores of dwarf galaxies consumed by our Milky Way. Of the roughly 160 globular clusters known in our Galaxy, about a quarter are located within the greatly obscured and tightly packed central bulge region of the Milky Way. This spherical mass of stars some 10,000 light years across forms the central hub of the Milky Way (the yolk if you will) which is made primarily of old stars, gas, and dust. 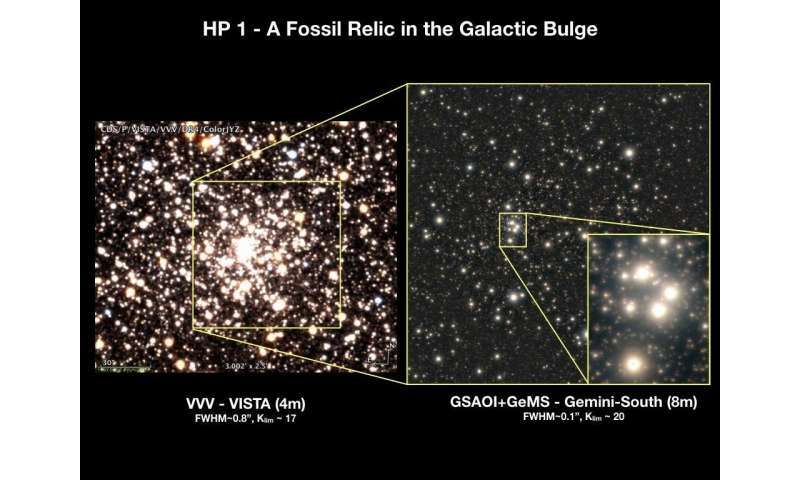 Among the clusters within the bulge, those that are the most metal-poor (lacking in heavier elements) – which includes HP 1 – have long been suspected of being the oldest. HP 1 then is pivotal, as it serves as an excellent tracer of our Galaxy's early chemical evolution. To determine the cluster's distance, the team used archival ground-based data to identify 11 RR Lyrae variable stars (a type of "standard candle" used to measure cosmic distances) within HP 1. The observed brightness of these RR Lyrae stars indicate that HP 1 is at a distance of about 21,500 light years, placing it approximately 6,000 light years from the Galactic center, well within the Galaxy's central bulge region. Kerber and his team also used the Gemini data, as well HST, Very Large Telescope, and Gaia mission data, to refine the orbit of HP 1 within our Galaxy. 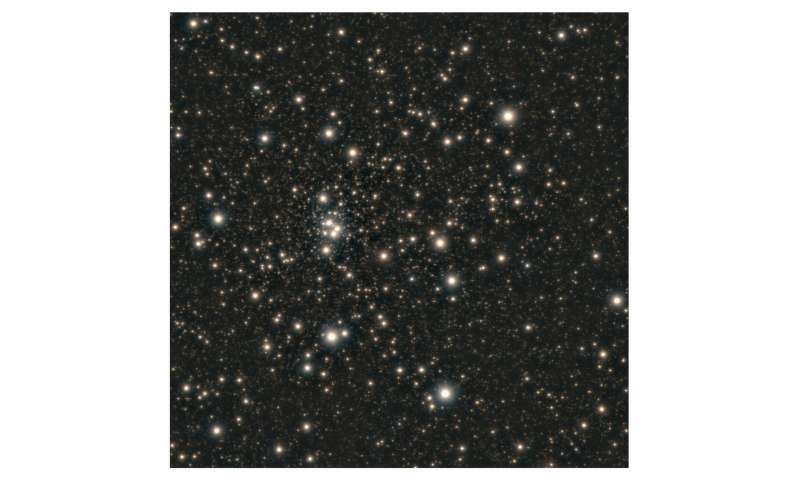 This analysis shows that during HP 1's history, the cluster came as close as about 400 light years from the Galactic center – less than one-tenth of its current distance. With this rich data set they confirmed that HP 1 is a fossil relic born less than a billion years after the Big Bang, when the Universe was in its infancy. That only a very committed merger maniac could assume. If instead, new matter is forming within the core at a much faster rate than metallicity can increase therein, then the star will appear young based on merger maniac star model assumptions. Simple really. The oldest stars in the universe just happen to be in our rather common galaxy?? Want to buy a bridge?? They're not the oldest, Tux. Just old.